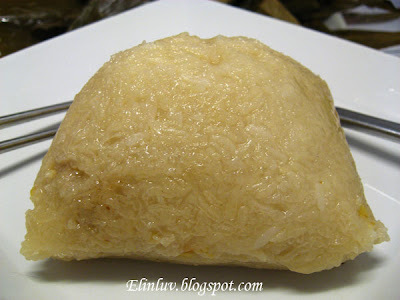 These are glutinous rice dumplings in the shape of pillows..kinda cute, different from the triangle shaped ones. I would like to thank my Piggy Cuz for these two ‘ pillows dumplings ’ homemade by her Aunty. * Yay, I can have these for dinner….one for myself and the other one for my other half. So happy. 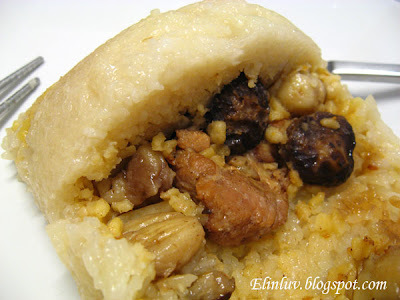 Thanks Piggy Cuz…it was good but not as good as grandmother’s …sshhh don’t tell the Aunty ! If I guessed correctly her Aunt must have learned from her grandmother ermmm also my grandmother who was one great woman. She made the most delicious dumplings ever! And every dumpling festival , every one of her children will get a few for their family and I looked forward to them. 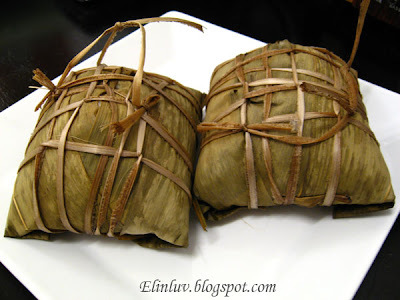 When I got married off, Mom continued to give me her share…so precious becoz each children will get a few only, becoz it was hard work for an old lady to wrap the dumplings all by herself. I should have learned from her too but too late now, she was called home many years back. This is what I regreted most! 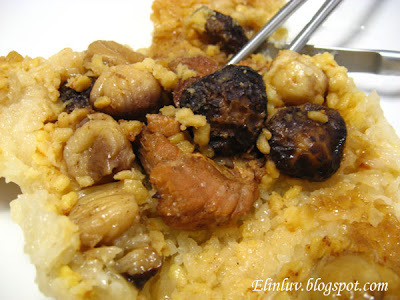 The glutinous rice remained in its original color becoz no thick sauce was used. 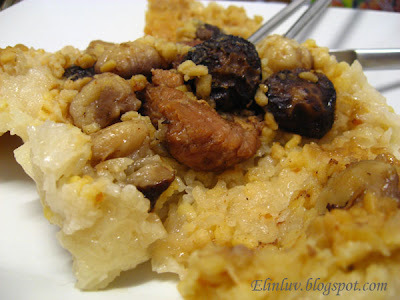 The fillings are just lean meat, chestnuts, some mung beans and some dried shiitake…..yummy is the word. 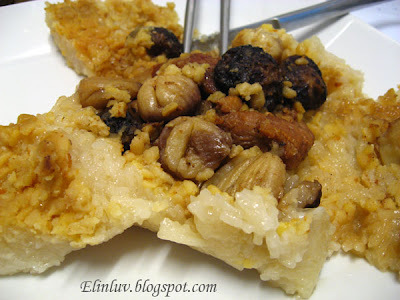 Homemade ones are better becoz you can pick your own favourite ingredients as fillings and I love these fillings…so many chestnuts…so delicious…it brought back memories ….grandmother’s pillow dumplings, I thought I never get to taste again! Thanks Piggy Cuz for this deliciousness! 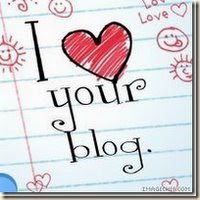 and Miranda I ♥ your blog too! Glad you enjoyed the dumplings :) We usually eat them with chopped Chinese parsley (yin sai) and spring onion (choong)............. and a bit of thick "black" sauce! Now, THAT is YUMALICIOUS! Congratulations on the award, Elin! I only started making dumplings after joining in food blogging...ha ha!